kelbysews: Fat Quarterly and a New QAL! My project is featured on Fat Quarterly's blog today! Go check it out! Pssst! If you're new to my blog, I'm having a 20% off sale right now in my etsy shop! Use the code "BIGMOVE" at check out! It all started with this quilt top from Jeni. I loved it and I wanted to copy it immediately! 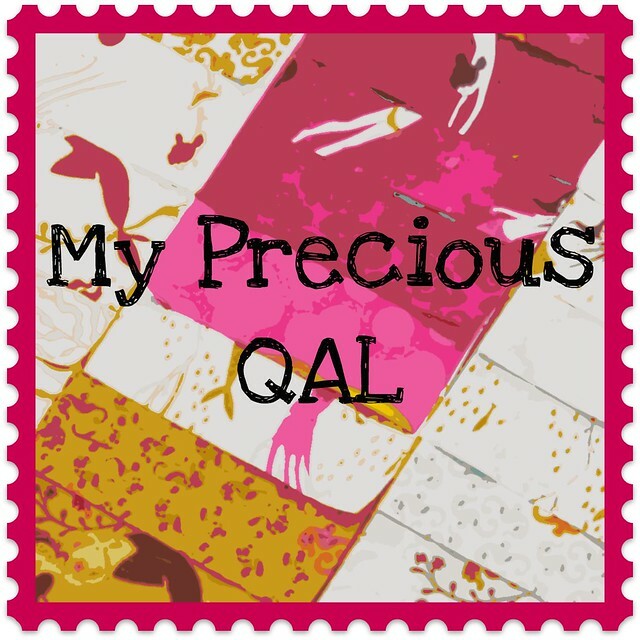 I'm thinking of starting a little QAL, but you don't even have to make a quilt!!! The only rule is that you have to use whatever fabric you've been hoarding! It doesn't have to be hard to find (though that's always fun), but it does have to be something you've been reluctant to use! You can make a quilt, a mini, a bag, a pouch, a pillow, whatever! Stop petting your precious fabric and make something fabulous! If you are participating in any other QALs, you can do double duty! Kaelin is helping me get things started and we're working on a Pintrest board HERE for inspiration! I'm also going to see if I can get a shop to donate a prize for anyone who participates! I'm still working out the details so stay tuned and get that rotary cutter ready! UPDATE: prizes are already being donated!!!! Great idea! Oh how I wish I could participate with Mendocino! What is your fabric choice? Oh it was you with the :) :( mularky! Oh I have hoarded too much to refuse a make-along! I love the emoticon mini, it's fab! I love your curved ruler project, so cheeky! Mine will be up on FQ Saturday I think. And that's a brilliant concept/ name for a sew-along. I might have to jump in and use up the rest of my echino. You know I'm up for it! 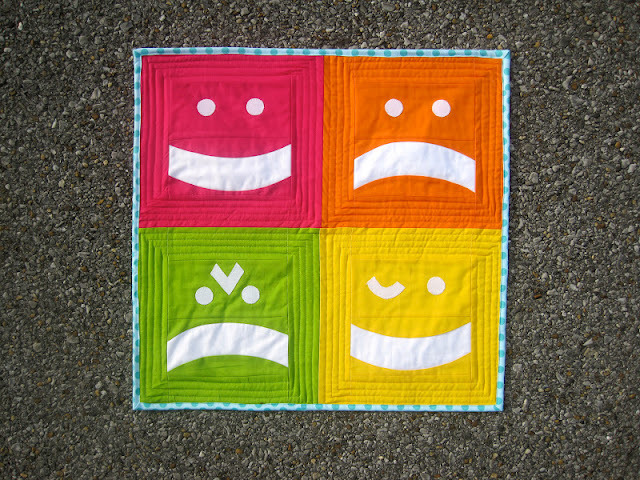 Also, your emoticon quilt is so cute!! I love this idea Kelly! Get us all to use stuff we love! I'm picturing you huddled in the corner stroking your Heather Ross like Golum. About right? And I love your idea for the quilt along! Great idea, brutal timing for me. Grrr! I have a stack and an idea, just too many things on the burners...I'll see what I can do, because it's time to cut that FFA2! Oh what a great idea! I've got my Mendocino scraps that I've been holding on to, waiting until my skills would hold up to my adoration. Well they're not there yet, but I'm ready to use the scraps anyway! Great idea! I do happen to have two fat quarter bundles of the entire Full Moon Forest line. I bought them when I first started sewing a few years ago. I have a bunch of yardage, too! I didn't even know I was starting a hoarding trend back then since I had only made one quilt at the time. I'm not sure what I'll use but Farmdale is tops on my list as my all time favorite fabric and I have a bunch of that too.